Abdominal tuberculosis (ATB) mimics various infectious, inflammatory, and neoplastic conditions and hence requires a high index of suspicion for accurate diagnosis, especially in low prevalence areas. It is difficult to consistently establish a histopathological diagnosis of ATB which underlines the importance of supportive evidences for institution of prompt empirical therapy to prevent associated morbidity and mortality. 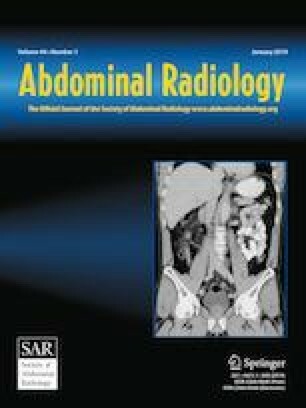 We retrospectively evaluated clinical and imaging features of 105 ATB cases and classified their CT findings based on peritoneal, lymph node, bowel, and solid organ involvement. Concomitant pulmonary and extra-pulmonary involvement was assessed. Abdominal pain (78.1%) followed by fever (42.9%) were the commonest presenting symptoms. Peritoneal TB (77.14%) most commonly presented with a mix of ascites (49.38%), peritoneal (28.40%), and omental involvement (27.16%). Lymphadenopathy (57.1%) most commonly presented as necrotic nodes (81.67%) at mesenteric, peripancreatic, periportal, and upper paraaortic regions. Commonest site of bowel involvement (cumulative of 62.85%) was ileocecal region, with the commonest pattern of involvement being circumferential bowel wall thickening without bowel stratification with mild luminal narrowing. Hepatic (13.33%) and splenic (16.2%) involvement predominantly presented as multiple microabscesses. Adrenal and pancreatic involvement was noted in 4.7% and 1.9% of patients, respectively. 38.1% patients showed concomitant pulmonary and extra-pulmonary TB. ATB has varied radiological features; however, peritoneal involvement in the form of mild ascites, smooth peritoneal thickening, smudgy omentum, multi-focal bowel involvement, necrotic nodes, and multiple visceral microabscesses point towards a diagnosis of ATB in appropriate clinical setting.